Greetings Craft Beer Drinkers! 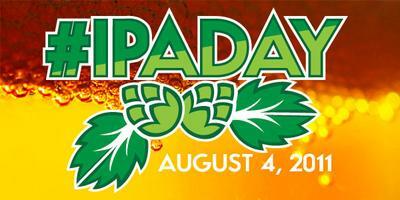 Welcome to International #IPADay — the world’s largest celebration of craft beer. International #IPADay is a grassroots movement created to unite the voices of craft beer enthusiasts, bloggers, and brewers worldwide, using social media as the common arena for connecting the conversation together. To participate, share your photos, videos, blog posts, tasting notes, recipes, thoughts with the world on Twitter Facebook, YouTube, WordPress, RateBeer, Foursquare, Gowalla, Yelp, Untappd or any other social media platforms you may use. Use the hastag #IPADay in all of your posts and then see what others are saying by searching the hashtag on google, twitter or other social media resources. Participants are also encouraged to organize “real-life” #IPADay events your local brewery, brewpub, restaurant, bar, home, or office. Share your events at RateBeer.com (note: must be a member to post an event).